After selling my 1965 GT Mustang, I wanted something a little "cooler" for summer driving. I went with the ultimate convertible, a motorcycle. 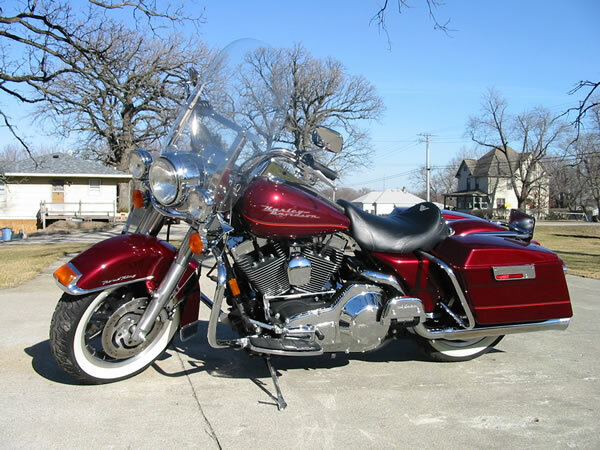 I ended up with a 2000 Harley Davidson Road King I purchased one year old. I road that thing every opportunity I got, which is mostly just to work, which is a 40 mile round trip, half in rural areas and half in the far Northern Chicago suburbs. I ride every day that it's above 32°F and no obvious rain coming on the radar. Then, on what was supposed to be the start of an awesome extended weekend, it all changed. I left work at noon on Thursday, September 29, 2005, to go home, get the wife and kid, and drive up to LaCrosse, WI, for my 15th consecutive year partying at the LaCrosse Oktoberfest. (To see some of the wild times, check out my Oktoberfest photos at http://fest.we9v.com.) On my drive from work to pick up my wife and kid to head up to LaCrosse, an 18 year old kid fell asleep behind the wheel, crossed the centerline, and hit me an my Harley nearly head on. I was able to turn a little at the last moment, so he hit the side of the bike and my foot, then causing me and the bike to roll. The bike and I rolled, me over the bike, then the bike over me, for a total of 7 to 10 times (it happened pretty quickly to get an accurate count). At one point, the bike and I became separated, with me rolling in front of the bike. Then the bike caught up to me and we retangled and rolled together a couple more times before we came to a stop with the bike on top of me, pinning me down. Obviously, I went to the hospital in an ambulance. I was conscious through everything, and of course the shock kicked in immediatley. I was so exicited about going to another Oktoberfest, then the paramedics said my foot was broken. I was so bummed that I was going to have to go to Oktoberfest in crutches. Little did I know at that time how broken my foot was. It was an open fracture (previously called a compound fracture) and my ankle was sticking out of my foot. It turns out that I was going to miss my first Oktoberfest in 15 years. I was more upset about missing 'fest than my broken foot or broken bike. I was not wearing a helmet. I did not have gloves on. I didn't have boots on. I did have a leather jacket, jeans, and casual leather shoes. I was very fortunate to have no head trauma, and nearly no road rash (I was mostly in a ditch) but my foot wasn't so lucky. 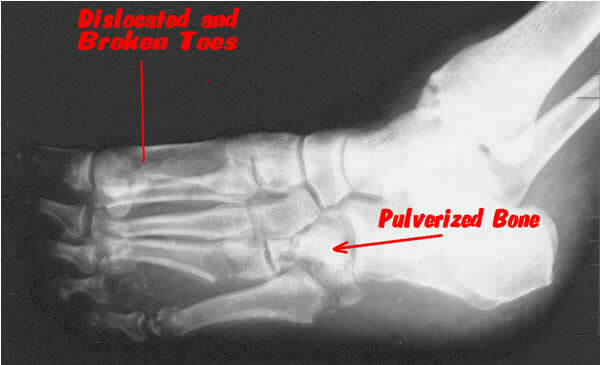 My foot had 9 broken bones, many of them shattered "beyond repair" according to the doctors. I had FIVE surgeries in the first three months, and another surgery a year later. The surgeon said he's been in the business over 20 years including trauma in Los Angeles, and has seen a lot of things, but this was one of the worst. Luckly, I was able to keep the foot, although it was questionable for a while. I was in a wheelchair for months, and crutches for nearly six months. I'm finally able to walk without crutches, but not without pain. Every step is pain. I'll probably never be able to run/jog even a single step. Not able to hop or jump, other than only on my good foot. Almost 11 months to the date of the accident, I finally got back on a bike. The local dealer loaned me a bike (mine was totalled at the time of the accident...I took the cash) that I got to ride for a couple days. Good news...I'm able to get the bike up no problem (my left foot, the foot that you need to push the bike up to get it off the kickstand, is my broken foot) and once again am enjoying riding. 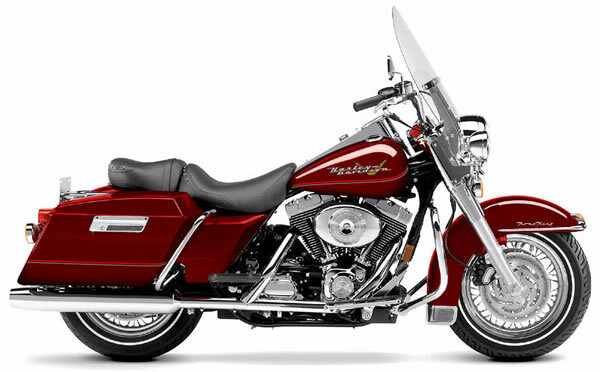 I'm now looking to buy a new 2007 Harley Road King, as soon as the dealer can get one in my old color. 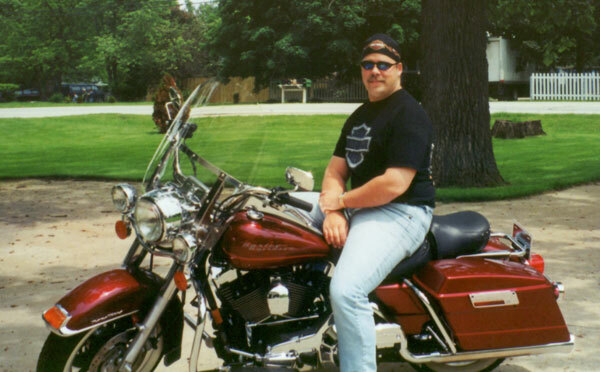 Here I am in the spring of 2001 with my first Harley. 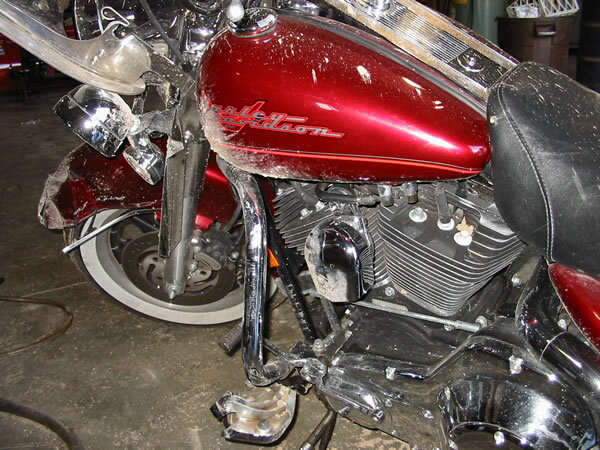 Here's the Harley stock photo of my bike, a 2000 Road King FLHR-I. It has a 88 cu.in. (1480 cc) V-twin and is fuel injected. Here's mine in the driveway. We had a 50°F weekend in January 2002. 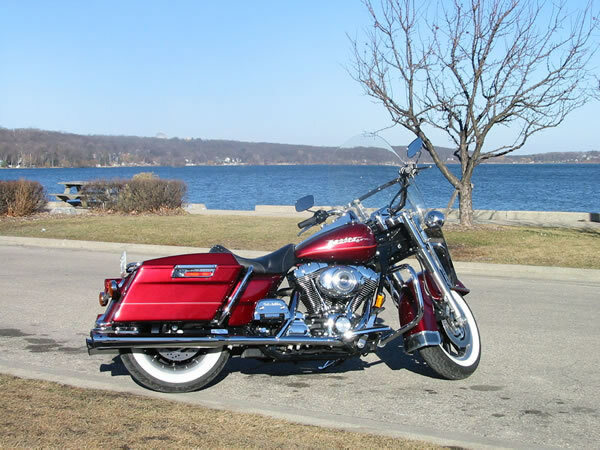 I took the opportunity to take the Harley out of storage and take a ride to Lake Geneva, WI. 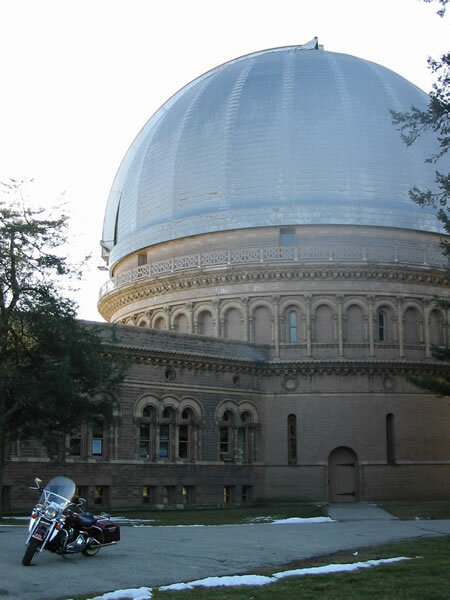 The Yerkes Observatory in Lake Geneva, WI, in January. 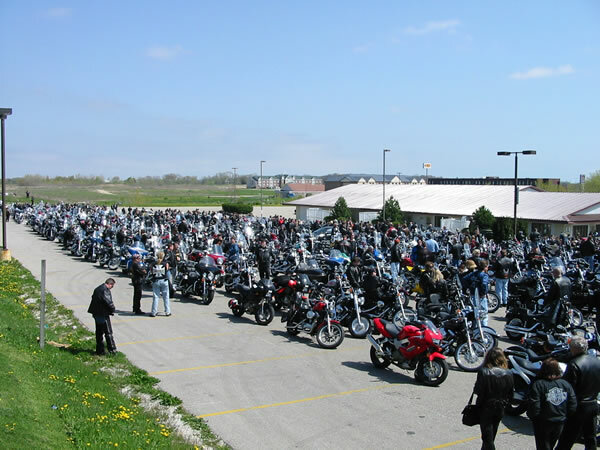 The Kenosha (WI) Chapter of HOG has an annual bike blessing and ride in May each year. LOTS of bikes participate. 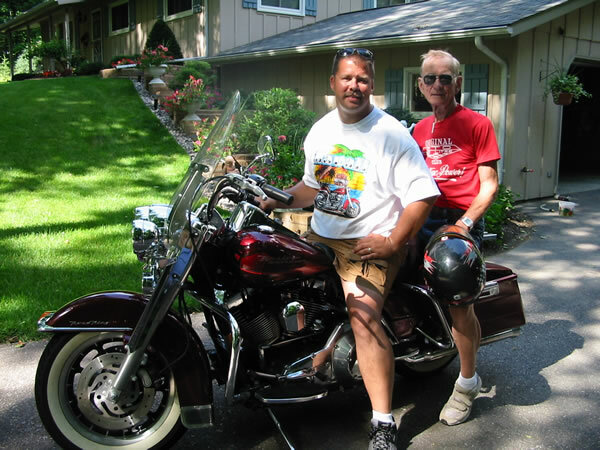 I took a ride up to my parents house in central WI and convinced my father to go on a ride with me. I think it may have been the first time he's been on a bike since he gave up driving them in 1987, 16 years later. 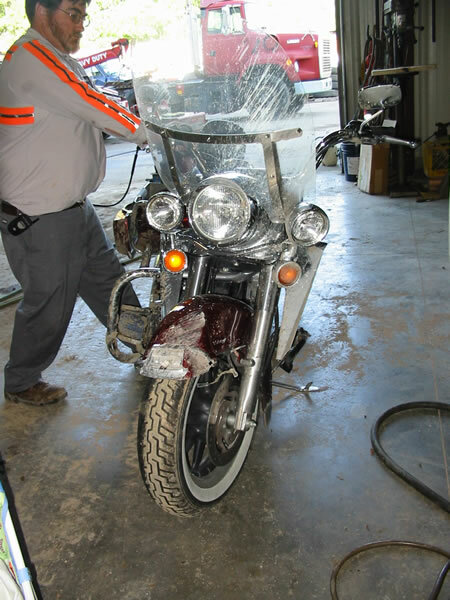 Here's what the bike looked like after the accident. It doesn't look all that bad, but the insurance company totalled it. 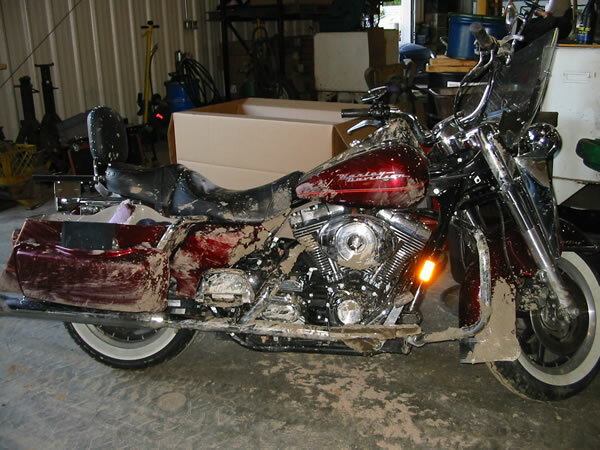 You can really tell that I ended up in the mud, which probably saved me lots of road rash. Notice how the toe next to the pinky toe (2nd from the bottom) is no longer connected to any bones. 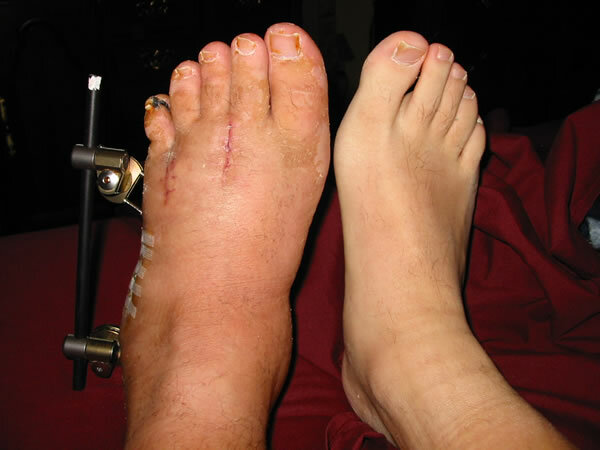 The bones that connect to my toes are dislocated by one complete toe. The pulverized bone is the "cuboid". Notice how the pinky toe bones have shifted to the right. They are still this way today. This is my left ankle. That black thing is dead skin, and when removed left a hole in my flesh nearly an inch deep, which eventually filled back in and was then covered with a skin graft from my upper leg. This is the other side of my left foot. Much of the dead skin had peeled off on its own, but a big patch of dead, black skin remains. 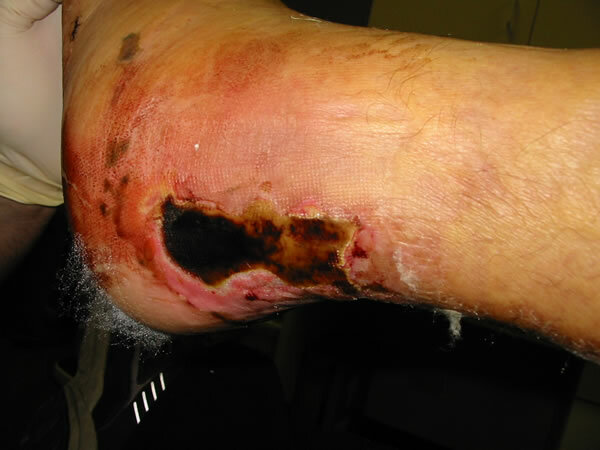 This too was removed and patched with a skin graft. A total of 8 pins in my foot, all of which were eventually removed. The black bar is called a fixator and somewhat kept my toes from caving into the hole left by my crushed cuboid bone. 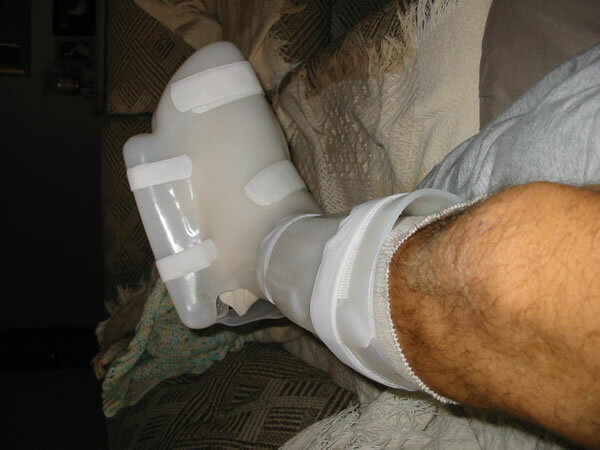 This was the stormtrooper boot I wore to protect all the pins, as well as keeping my foot from stiffening up in a downward position. The cool thing about this was that it was removable, so when I had an itch, I could remove it and scratch it! The bad thing was that, even though it was removable, I had to wear it at all times, even sleep with it. You can see how that black patch of skin has now healed up due to the skin graft. I had the bar on my foot for three months. You can see how swollen my foot still was. Football size. Nearly three months later and my foot is still massively swollen. And three months of having those pins and bar installed.